DHAKA, Jan 4 2012 (IPS) - With floods, droughts and other calamities battering deltaic Bangladesh regularly, farmers need little prompting in switching to climate-resistant varieties of rice, wheat, pulses and other staples. The crop diversification, actively supported by the government’s research institutions, is already benefitting the 145 million people of this densely populated, predominantly agricultural South Asian country. 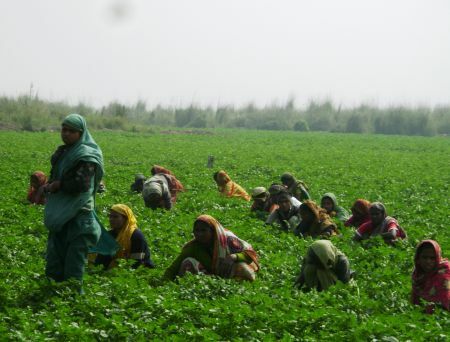 Mosammet Sabera Begum, 38, a farmer in Purbadebu village, Rangpur district, about 370 km from the capital, earned Bangladeshi taka 14,000 (177 dollars) last summer selling paddy cultivated on two acres of land leased from a local landlord. “I’d planted ‘paijam’ (an early maturing rice breed) which is ready for harvest about 30 days earlier than traditional varieties that take 150 days. It is superior in quality, has higher yield and fetches better pric,” said Sabera, mother of two teenage girls. The rice variety that Sabera resorted to, developed last year by the Bangladesh Institute of Nuclear Agriculture (BINA,) withstands floods, drought and pest attacks and gives 4.5 – 5.5 tonnes per hectare compared to regular varieties which yield a maximum of three tonnes per hectare. “The ‘BINA Dhan-7’ variety holds extra benefit for farmers. It can be sown during the monga (lean season beginning September) or while regular varieties are still maturing in the fields. So, in a sense, it is an additional crop harvested in shorter duration,” Abdus Salam, head of research at BINA, told IPS. In fact, BINA Dhan–7 combats seasonal food shortages by creating job opportunities for farm labourers who would wait for, on average, two extra months before the regular variety of rice would ripen. Far in the southwest, 43-year-old Nargis Ara Begum dries harvested paddy in an open courtyard that she and her husband, Mukul Miah, had cultivated on highly saline soil. “We never expected to get such a good harvest in salty soil,” said Nargis who owns the small granary next to her home in the Chaukani village of Satkhira district, located some 320 km southwest of Dhaka. Nargis and her husband had cultivated a rice variety developed by the Bangladesh Rice Research Institute (BRRI) named, ‘BRRI -47’, which survives highly saline and water-logged conditions. Farmers who had given up hope of growing crops in salty soil are keen to follow Nagis’s example and ready to invest in the new rice variety. Not very far from Koyra lives Asma Begum, 32, a woman farmer in the Boro Nawabpur village of coastal Bagerhat district, who borrowed 914 dollars from a local non-government organisation to cultivate rice in saline soil, is confident of recovering her investment. “I trained at the agriculture extension department learning to handle saplings. I heard that farmers in other districts successfully raised BRRI-47 and earned good profits,” said Asma, who now trains other local farmers, mostly women, to cultivate BRRI-47 rice. Last summer, in Raghunathpur village in the Birampur sub-district of north-western Dinajpur district, Raxmi Mayaboti, 39, and her husband, Kailash Sarker, cultivated a new variety of wheat on three acres of land in the arid Barind Tract – a desertified region spread over 8,000 sq km. The environment here is dry and hot during summer and growing crops in such conditions is considered impossible, except for ‘BARI Gom 25’ a new variety of wheat developed by the Bangladesh Agricultural Research Council(BARC). Other climate-proof varieties of crops developed in Bangladesh and available in the market include tomatoes, sweet potatoes, onion, pulses, mustard oil and sugarcane. But Bangladesh’s agricultural institutions have been most successful with cereals. They have developed some 190 varieties of wheat and rice capable of withstanding drought, salinity, flooding or temperature extremes also come up with six salt-tolerant pulses. Despite such advances, experts feel that Bangladesh needs better cooperation from international agriculture research agencies to help farmers adapt to climate change. The anxiety is understandable. Bangladesh’s ministry of agriculture estimates that about 80,000 hectares of arable land are lost every year due to natural disasters, prolonged floods, saline water intrusion and extended drought.